Ulster have signed Irish qualified prop Dave Ryan from Italian side Zebre on a two-year contract. The 27 year-old from Cork made 10 appearance for Munster between 2009 and 2011 and played for Lazio Roma before moving to Zebre in 2012. "The opportunity to join a team with the quality and character of Ulster was too great to pass up," said Ryan. "I'm excited to continue my career with a side I've always admired for its work ethic, style of play and physicality." 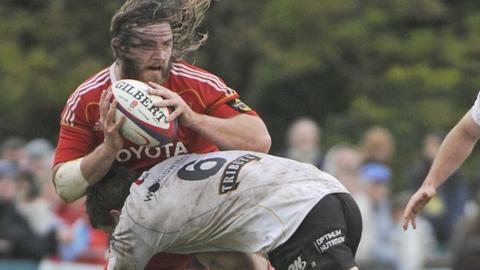 Ryan has played 20 Pro12 games for the Italians and has made six appearances for Zebre in the Heineken Cup. "I have developed a lot as a player and a person during my time in Italy," he added. "I look forward to working hard and being part of a team and organisation who compete at the highest level of European rugby." David Humphreys, Ulster's Director of Rugby, believes Ryan will be a valuable addition to Mark Anscombe's squad. "Dave is an experienced Irish prop with solid experience in both the Pro12 and Europe," he said. "He adds further squad strength to the key position of tighthead prop and I have no doubt that he will be a huge success at Ravenhill."